"We are calling to let you know we have now completed two very enjoyable high altitude hikes and scrambles. 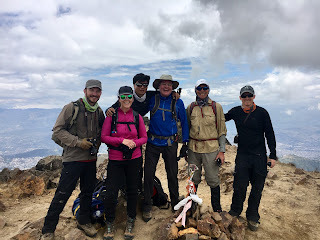 On Sunday, we climbed Pasachoa (13,776 ft / 4198 m) in perfect weather. Everyone enjoyed hiking through the beautiful high grasslands and then scrambling up to the summit. We had great views of many of Ecuador's high peaks. "Today we climbed Rucu Pichincha (15,413 f / 4697 m), again with perfect weather. We had good views the whole day, and I am pleased to say everyone, again, felt comfortable with the altitude. We have very good acclimatizers on this team. The whole group on the Summit of Rucu Pichincha. Priscilla Clayton. 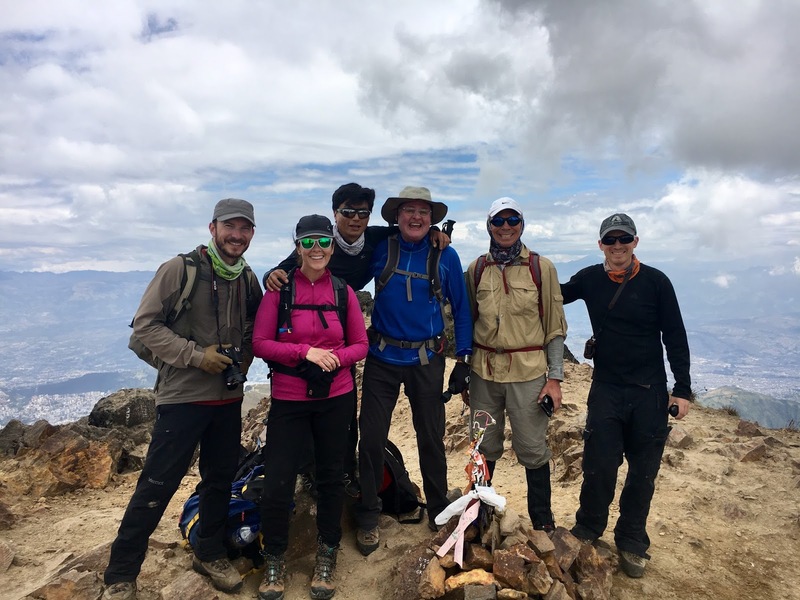 "Shortly, we will start our drive to Hacienda Guachala, which is in a little settlement just below the big peak of Cayambe (18,996 f / 5789 m), which is our first high altitude goal. Tonight we will have dinner at the hacienda and lodge there, and tomorrow we will drive up the mountain to the hut that is on its flank. We'll probably hike up to the glacier in the afternoon, and do some skills training and then again on Wednesday. We'll go to bed early Wednesday night and get up really early for our ascent of Cayambe the following day. "Everyone is feeling good and they are in good shape too, so we are all looking forward to putting out our best effort on Cayambe." "Everything has been organized so extremely well. My expectations have been exceeded every day! The two hikes were well chosen – great views and just the right amount of workout. We’ve have had good weather. The acclimatization has been well choreographed with us going slightly higher each day. "My team members and I all felt good on the two hikes. Everyone is really pleased with how they are adjusting to the altitude, Some of us are using Diamox and some not, but all are doing well. "Final thoughts – We are excited to be getting onto the glacier tomorrow and we are all enjoying each other. Good people in this group!! "We'll talk to after our Cayambe climb. Wish us luck."